I’m not one bit Irish. I rarely celebrate St. Patrick’s Day. I don’t wear green, and on March 17th I don’t drink beer. In truth, I will only eat corned beef and cabbage if someone else invites me over for dinner. It’s not that I don’t like St. Patrick, but growing up in an Italian household, no one mentioned St. Patrick’s Day. It was just never a thing for my family. Nonetheless, without giving a huge history lesson, I’d like to give a shout out to St. Patty. After all, he was the missionary responsible for bringing Christianity to Ireland. Because St. Patrick’s Day lands during Lenten season, for celebratory purposes, the ban on meat and alcohol is lifted just for that day. Because of limited time, “devout” Catholics have to get as much alcohol in as possible before they go back to celebrating Lent. As my husband Bill puts it, St. Patrick’s Day is when “all the rookies come out to drink.” Why? Because one could be .0005% Irish, and they show up wearing green, and get sloppy drunk “celebrating” a saint that they know and care nothing about. As for the food, corned beef and cabbage is more of an Irish-American creation than it is a traditional Irish dish. In fact, in Ireland, St. Patrick’s Day fare is quite different than what Americans eat here in the United States. 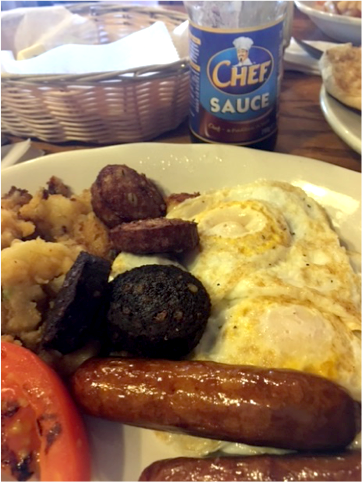 One would begin the day with a traditional Irish breakfast, which I was fortunate enough to try on a recent business trip to Rockland County New York. when I stopped for breakfast at the Muddy Brook Café. When I ordered tea, the server, complete with a thick Irish brogue asked if I wanted “Irish tea?” Of course, I accepted. Because of the early morning drive through the Bronx, I was not too quick on the uptake that morning. It wasn’t until I could focus fully on the menu that I realized I was in an Irish café. The menu offered “traditional Irish breakfast,” which I ordered. The Irish breakfast consisted of eggs, rashers, black and white pudding, potatoes and Irish brown bread. I questioned the server as to what the items were and she happily educated me. Black and white pudding is what I would describe as some sliced black and white sausage. This pudding is mildly spiced and has a gritty texture, which I have since come to find out is due to a high proportion of oats. Rashers are what Americans call bacon. After serving my breakfast, the server came back around with “Chef Sauce.” Chefs Sauce is a condiment traditionally served with meat dishes that is widely used in Ireland and the United Kingdom. I can only describe it as Worcestershire meets ketchup. 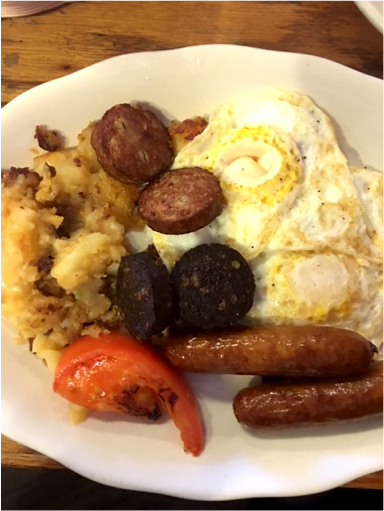 I enjoyed the breakfast even though it was heavier on the meat than I’m used to so early in the morn’, but it was worth the research because how many people can say they’ve had a traditional Irish breakfast in upstate New York? Nonetheless, unlike boiled meat, potatoes and cabbage here in America, a traditional St. Patrick’s Day dinner in Ireland is as different as the breakfast because it usually consists of lamb stew, colcannon and barmbrack. Add potatoes, carrots, and 1/2 cup water. Cook, covered, until vegetables are tender and stew has thickened, about 20 minutes. Season with salt and pepper. Let cool completely before storing. Stir in parsley just before serving. Basically, “colcannon” is mashed potatoes with kale, or some other leafy green with spring onions mixed in. 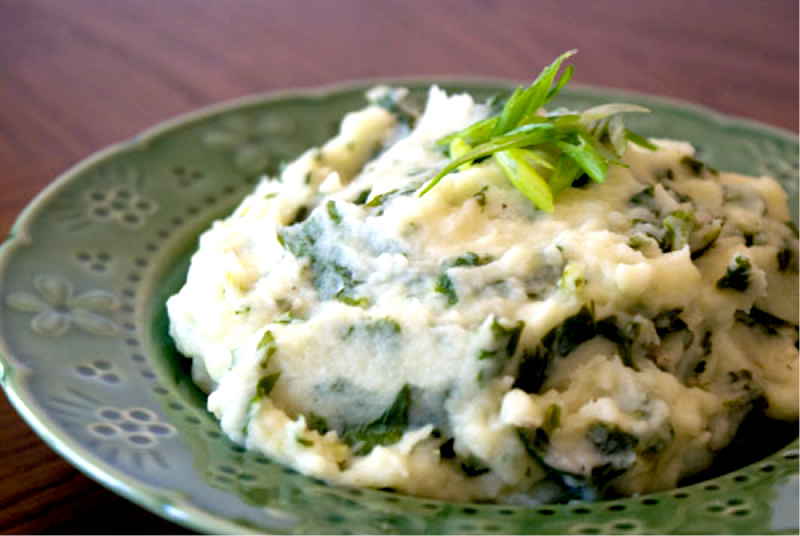 With all of the health benefits of kale you can eat colcannon without much guilt. 1. Boil the potatoes: Put the potatoes in a medium pot and cover with cold water by at least an inch. Add 2 tablespoons of salt, and bring to a boil. 2. Cook the greens and the green onions with butter: Return the pot to the stove and set over medium-high heat. Melt the butter in the pot and once it’s hot, add the greens. 3. Mash the potatoes with milk or cream, add greens: Pour in the milk or cream, mix well, and add the potatoes. Reduce the heat to medium. When you see a photo of “barmbrack” you instantly think fruitcake! 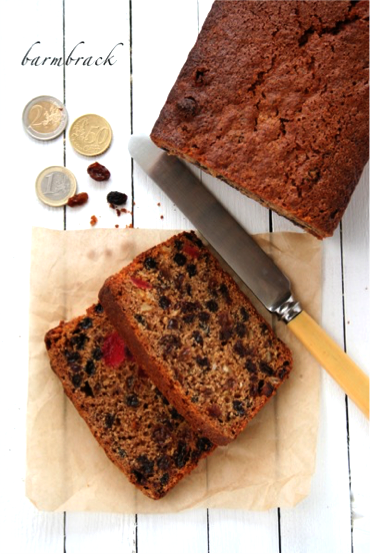 Barmbrack is traditional and is usually served slathered in butter and well worth a try. Darina Allen says that even though this is very rich bread, it’s traditionally served sliced and buttered in Ireland. If you can’t get sultanas and/or raisins, just use all raisins instead, or you could substitute dried cranberries too. Darina’s recipe calls for glacé cherries, but you could use chopped dates instead or leave them out altogether. I’ve been cheeky and have swapped out some of the tea for whiskey in this recipe, but if you don’t want to use alcohol in your barmbrack, just uses 300 ml (1 1/4 cups) tea. For a twist, use Earl Grey or even chai tea instead of regular black tea. If you want to add in some charms, like a ring or coins, just be sure to wrap them well in parchment paper first before adding them to the batter! Put the raisins, sultanas, currants, cherries and candied peel in a large bowl, one that’s big enough to accommodate all the ingredients later on. Pour over the tea and whiskey or Cointreau and allow the fruit to soak for at least 30 minutes or even overnight. When you’re ready to bake, preheat the oven to 180°C (350°F). Line a 450 g (1 lb.) loaf tin with parchment paper or a loaf tin liner. Add in the beaten egg, flour, sugar and mixed spice to the fruit and tea mixture. Stir well until everything is just combined. Pour the batter into the prepared loaf tin. Bake for about 1 1/2 hours or until a skewer comes out clean. Leave to cool on a wire rack before slicing. This keeps very well in an airtight tin. If you’re feeling adventurous and are looking to avoid the non-beer induced headache that comes along with the nitrite/salt induced version of St. Patrick’s Day Americans are used to, then look no further than these recipes. Although, at times, Irish, much like British, food has a bad reputation, these recipes provide highly nourishing ingredients. So, don’t be afraid to sharpen your cooking and baking skills, and, in the process, impress your friends and family this St. Patrick Day by serving traditional Irish fare.